Vasanthi is a graduate from London University and Dragon Rises College (2004), and holds a Ph.D from the University of Cambridge, UK. She is Nationally Board Certified in both Acupuncture and Chinese Herbology. She started studying Contemporary Chinese Pulse Diagnosis in 2001 and continues at an advanced level with Dr. Leon Hammer. Dr. Vanniasingham has a private practice in Gainesville and Chiefland, FL. 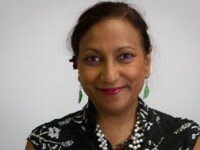 Dr. Vanniasingham currently teaches courses in Acupuncture and Oriental Medicine.